Meriwether Lewis and William Clark are best known for their exploration from 1804 to 1806 of the Louisiana Purchase and the Northwest Territory in what is now part of the United States. Lewis, the personal secretary to president Thomas Jefferson (1743–1826), was appointed by the president to lead the exploration of the 2 million square kilometers (about 800,000 square miles) of land purchased in 1803 by the United States from France, the Louisiana Purchase. 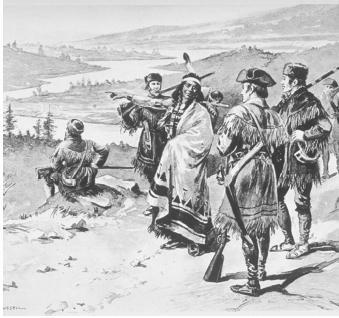 In turn, Lewis asked William Clark, a former U.S. Army friend, to be a co-leader of the expedition. Meriwether Lewis and William Clark relied on Sacagawea of the Shoshone Tribe to serve as a guide and interpreter during portions of their expedition to find the Northwest Passage. Sacagawea, with her infant son Jean-Baptiste Charbonneau, was the only woman to accompany the thirty-three members of the permanent party to the Pacific Ocean and back. and later moved back to Virginia. He liked exploring his surroundings and would roam the wildernesses of Georgia and Virginia. These early explorations would prove useful in his later life. Lewis's military experience began with the Whiskey Rebellion in 1794. After the rebellion was halted, Lewis joined the U.S. Army. He eventually became a paymaster, traveling up and down the Ohio River, and through this position he met Captain William Clark. William Clark, born in Virginia in 1770, moved with his family to a Kentucky plantation as a teenager. In addition to learning about the wilderness, Clark learned early about Native Americans, as they, too, lived in the area. He eventually joined the military as several of his brothers, including George Rogers, had done earlier and, at one point, served with Lewis for a short time. Lewis and Clark's mission, called by Jefferson the Corps of Discovery, was to find the Northwest Passage, a waterway sought by earlier explorers that would connect the Atlantic Ocean with the Pacific Ocean. Waterways were like today's highways. Jefferson thought that finding such a passage would increase trading with other countries. A system of connected waterways would allow people and goods to travel from one place to another more easily. Jefferson wanted Lewis and Clark to keep detailed notes on everything they saw and experienced. They were to map their expedition and describe the unexplored territory, including the climate, game, and vegetation. Clark mapped the expedition while Lewis collected soil and plant samples. In addition, Jefferson told them to make peaceful relations with the Native Americans that they met. After assembling a crew, Clark, using a keelboat, set off from St. Louis on May 14, 1804, and traveled upstream on the Missouri River. Lewis joined the crew on May 20. From the beginning, the crew noted that the river was rapid and muddy. The banks of the Missouri would cave in, and the deep mud would make it necessary for the men to sometimes use long poles instead of oars to push the boat forward. Clark usually stayed on the boat, since he was more knowledgeable about the river than Lewis. The crew continued traveling until late October 1804 when they set up camp for the winter. They encountered Mandan and Hidatsa Native Americans. At this time, Sacagawea, a Shoshone, and her husband Toussaint Charbonneau, a French trader, joined the expedition to act as guides and interpreters through Shoshone country. In April 1805, Lewis and Clark began their river expedition again, and by April 26 they reached the intersection of the Yellowstone and Missouri Rivers in present-day North Dakota. Lewis reported an abundance of timber, buffalo, elk, antelope, deer, bear, and wolves. He noted that wolves could catch antelope easily because antelope were not good swimmers. As the explorers encountered different terrain and climates, such as the Great Plains, the Rocky Mountains, and semi-desert conditions, the amount of game and timber varied. On June 2, the expedition reached the junction of the Maria's and Missouri Rivers in present-day Montana. The crew noticed that the bluffs were getting lower, signaling the plains, and at this junction did not know whether the Missouri River was the north or south branch. Lewis and Clark split up in order to investigate both branches and finally decided to travel along the south branch because the water was clearer and swifter, which is indicative of being near the source. They wanted to find the source of the Missouri. Lewis traveled ahead of Clark, and on June 13 found the waterfall of which the Native Americans had warned him. He sent word to Clark that he had found the waterfall, and, therefore, they had chosen the correct river to follow. In all, Lewis found five waterfalls. The expedition arrived at the junction of the Three Forks, the beginning of the Missouri River, on July 25. After several days they reached the Continental Divide. Expecting the Columbia River to be on the other side, they were disappointed to find more mountain ranges and no northwest passage. The need for horses became imperative if they were to continue. Lewis and Clark acquired horses from the Shoshones and continued their journey through the Rocky Mountains where they encountered the Nez Perce. The Nez Perce showed the explorers how to make dugouts, or canoes, to help navigate the Clearwater and Snake Rivers. On October 16, the crew reached the Columbia River. Lewis and Clark's outbound route is shown in red, and return route in green. The expedition occurred between May 1804 and September 1806. Along the Columbia River, the explorers encountered a rainforest climate. Fish, especially salmon, were plentiful in the river. Traveling became easier as the current flowed with the explorers now, and by November 7, the crew knew they were getting close to the Pacific Ocean because the river water became saltier, and waves rocked the boats. Finally, on November 18, 1805, the Corps of Discovery reached the Pacific Ocean. After spending the winter in the nearby region, Lewis and Clark started their return trip on March 23, 1806. The crew split up in early July with Clark exploring the Yellowstone River while Lewis explored a shortcut to the Great Falls on the Missouri River and also explored the Maria's River. On their westbound trip, Lewis and Clark went out of their way by following the Missouri River to its source. They reunited on August 12 at the junction of the Yellowstone and Missouri Rivers. From here, the crew could travel up to 129 kilometers (80 miles) a day because they were headed downstream, and the current was with them. They arrived back in Saint Louis on September 23, 1806. Following the expedition, Lewis was named the governor of the Louisiana Territory while Clark was given the position of Superintendent of Indian Affairs. Lewis's life began falling apart shortly after his appointment, and he died in 1809. In 1813, Clark was appointed governor of the Missouri Territory, formerly known as the Louisiana Territory. He died in 1838. SEE ALSO Columbia River Basin ; Transportation . DeVoto, Bernard, ed. The Journals of Lewis and Clark. Boston, MA: Houghton Mifflin Company, 1981. Herbert, Janis. Lewis and Clark for Kids: Their Journey of Discovery with 21 Activities. Chicago, IL: Chicago Review Press, Inc., 2000. Lewis and Clark: The Journey of the Corps of Discovery. (videocassette) Ken Burns, dir. Washington, D.C.: Florentine Films and WETA, 1997. Roosevelt, Theodore. The Winning of the West: Louisiana and the Northwest, 1791–1807. Bison Book, Vol. 4. Lincoln, NE: University of Nebraska Press, 1995. Biography of Lewis and Clark. LewisAndClarkTrail.com <http://www.lewisandclarktrail.com/biography.htm> . Circa 1803. Lewis and Clark: Inside the Corps. PBS Online. <http://www.pbs.org/lewisandclark/inside/circa.html> . The Ethnography of Lewis and Clark: Native American Objects and the American Quest for Commerce and Science. Peabody Museum of Archaeology and Ethnology, Harvard University. <http://www.peabody.harvard.edu/Lewis_and_Clark/> . In early 2003, Monticello—the home of president Thomas Jefferson, located in Charlottesville, Virginia—hosted the launch of a nationwide observance of the 200th anniversary of Lewis and Clark's historic trek to the Pacific: it was on January 18, 1803 that Jefferson had requested the expedition. Twenty-three federal agencies signed a memorandum of understanding in support of the Lewis and Clark Bicentennial Commemoration. Lewis and Clark: The Journey of the Corps of Discovery (1997) is a 4-hour documentary directed by Ken Burns and originally shown on the Public Broadcasting Service (PBS). Using the journal entries of several expedition members, the film weaves the story of the members within the Corps of Discovery on their search for the Northwest Passage. Beginning with an explanation of why Lewis and Clark were appointed commanders of the expedition, viewers learn, from the explorers' own words, about the game, climate, and vegetation encountered on the trip into the Northwest Territory. Burns invites viewers to re-trace the trail of Lewis and Clark along the Missouri and Columbia Rivers to the Pacific Ocean, including an account of the crew's encounters with various Native American groups.